The symbol for The HDFC School is an open book which takes the form of wings, ready for ascend. The notebook is a graphical representation of the inherent focus of The HDFC School on academic excellence. The open book taking shape of wings also represents empowerment to soar high and achieve ambitions. It embodies 'the soul of freedom' derived from an open, positive and constructive ambience that nurtures creativity, collaboration and the desire to excel. The human figure in the logo is ready to embark and embrace the world. It draws its strength from the three promises of the institution - Educate, Excel, Empower. The logo also captures the spirit of leadership and accomplishment of the brand promise, symbolised by the stars. The 'Serif 'Font has been used to reinforce the stress on a 'formal education'. It is sharp, serious and upright. Small serifs (also referred as Petit or semi serifs) add to the modernity and contemporariness of the logo. The arrangement of the logo is informal, yet stylised and aims to represent the focused and state-of-the-art modern pedagogy embedded in teaching methods of the school. 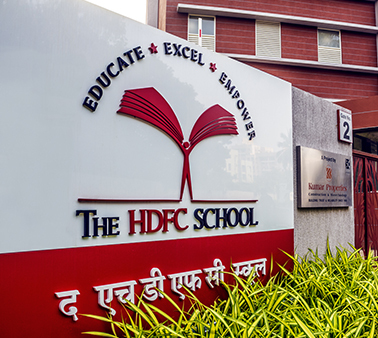 The colours of the school logo are drawn from the brand colours of HDFC Limited. On one hand, while the colour red signifies excitement, energy and action, the black adds to elegance and sophistication of the logo.